This was my first year going to Vegfest! 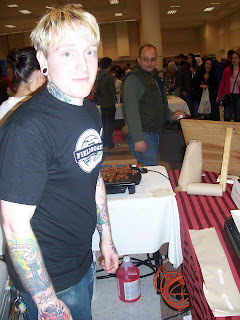 To go as a vendor was a great because you get to meet with lots of other people that work for the veggie and vegan food companies…not to mention sample their wares. We had the prime spot this year front and center Thanks to Stewart from the Vegetarians of Washington. There must have been a couple thousand people through on Saturday DESPITE the typical downpours outside. Aaron Lee, vegan and production/pallet shipping guru of Field Roast joined me for most of the day. David Lee, owner and founder (but no relation to Aaron Lee), helped get us rolling and came back for some of the evening events since our booth at VegFest was all his on Sunday. This was truly a great experience for me, to be able to meet with tons of customers, hand out the samples and tell people a bit about who we are and what we do. From some of the contacts I made I venture that there will be some new business and a donation opportunity or two. For the festivities we got some buttons made to hand out. Rex and Rebecca from Buttonmakers.net, resident button producers of Georgetown, made it happen within a day, so much appreciation to them! They were a hit! We did little buttons that were hip and said boldly “EAT vegetarian MEAT” which conveys that we at Field Roast make meat, just not from animals. Our meat is 100% vegan, made with grains and vegetables, and artisan made into netted and linked chubs and sausages…like the charcutterie style smoked meats, old school techniques that are key to flavor and texture. We had a line around the corner for our sausage bites, and with the help of a lovely volunteer, grilled em up just as fast as they disappeared. Some of my other favorite tasty bites I sampled during my walk through the fest was Mighty O, with their delectable vegan doughnuts…Healthy Hedon Chocolate Silk pie…Naked Juice…Wildwood Tofu burgers…and the sushi Tofu Phil made with his flavored tofus by the name of Small Planet Tofu. 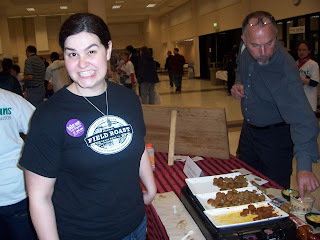 Now I am REALLY looking forward to VegFest Portland! !